These free bird feeder plans are made entirely from old cedar fence boards. So not only are the plans free, but the materials are free as well. If you have been browsing mycarpentry.com, you may have noticed that many of my projects make use of old cedar fence boards, as well as other used materials. These projects don't require many power tools to build. 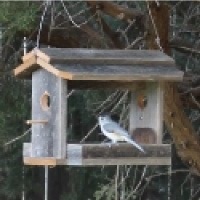 I used a table saw to rip the wood and a miter saw to cut the materials to length, but you can use a circular saw, if that is the only saw you have available, to make your own bird feeder using these two free bird feeder plans. These wooden bird feeder plans make building your own bird feeder a simple project. This bird feeder features a base made of aluminum screen and a place for birds to rest at each end as they consider eating the delicious bird food. 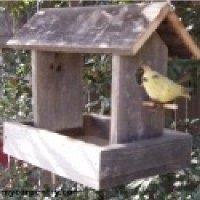 Here's a homemade bird feeder that is simple to make and is very functional. One thing I like about this particular bird feeder is that the bottom that holds the seed is made of aluminum screen. This way, if the seed gets wet, it can dry out quickly. Making a squirrel feeder might keep the squirrels out of your bird feeders. Well... okay, probably not. :-) This squirrel feeder is quick and easy to build and only costs a few nails, if you have an old fence board handy. This year, we have had more squirrels than usual visit the "squirrel proof" bird feeder that we have had for the past several years. This bird feeder worked well at first, but it didn't take long before the little varmints figured out how to get through the small squares in the cage that protected the bird food. We first saw the Squirrel Buster Plus at a store near Fredericksburg, Texas. There was a video playing next to the bird feeder that showed several attempts by squirrels to get to the bird food, but with no luck. This looked like the perfect squirrel proof feeder. We ended up buying ours from Amazon.com. If you decide to buy one for yourself, you will get a good deal through Amazon, and if you purchase it through the link on this page, you will be helping to support our site. The video below shows a squirrel trying to get to our Squirrel Buster Plus two days after we hung it up.